When most people think of pickled food they think of vinegar. You’ll notice that none of my recipes call for vinegar and there is good reason for that. While vinegar is great for preserving food, it does nothing to enhance the nutritional value of the food it’s preserving. Rather than just preserve food, lactofermentation actually increases the nutrients in the food as well as adding beneficial bacteria that we are finding out are essential to healthy immune function. Why don’t more people do it? I think for one, we’ve been so ingrained with the idea that bacteria is bad, we’re scared we’ll get sick from it. Secondly, vinegar pickling is more predictable and if your going to market a product, predictability is important. Also, unless you pasteurize or can the finished product, the lactofermented food needs to stored at a cool temperature, in a root cellar or refrigerator. You can process a lactofermented product but that sort of defeats the purpose. Third, lactofermentation takes time. There is not a lot of effort involved in getting a ferment started but you do need to wait. Some ferments take under a week where others like sauerkraut can takor tween 1-3 months. Flavors also improve with time when the ferment is moved to cold storage. Some won’t touch their sauerkraut until it is at least 6 months old. So is lactofermentation worth it? First let’s talk flavor. Lactofermented foods have a much more complex and interesting flavor. Some ferments can even be effervescent which is crazy awesome! I love cracking open a jar of fermented green beans and seeing a rush of bubbles to the top. The fizz adds an incredible pop of excitement with your first bite. Love it! No store bought pickled green beans will ever do that. Second, the health benefits are worth it. We are all born with a sterile gut and we need good bugs to populate our guts. Did you know humans carry 10-12 lbs of bacteria in our guts? That’s a lot of bugs! Our first dose of bacteria that colonize our bellies comes from the birth canal. You really do inherit your mother’s gut. It gets further colonized through breastfeeding. The guts of breastfed babies are significantly different than those of formula fed babies. So many children start off disadvantaged and aren’t helped by constant onslaught of antibiotics and overly sterile environments. Cultured foods are one way to turn that around and fix a messed up gut. You hear of yogurt being good for your gut, but did you know there are many many probiotic foods out there not just yogurt? All of my ferments that you see me post about on Ferment Friday are full of beneficial bacteria. And not just bacteria either. The result of the bacteria feasting and multiplying is increased vitamins! So your fermented sauerkraut is higher in vitamins, especially B vitamins, than its unfermented counterpart. During fermentation, ascorbic acid is converted into ascorbigen, a proven anti-cancer nutrient. Nutrient dense, oh yeah! These good bugs eat the sugar and starches in the vegetables making them more easily digestible as well. So how does lactofermentation work? Everywhere and on everything is bacteria particularly lactobacillus. Lactobacillus bacteria thrive in a salty anaerobic environment where most other bacteria do not. You can add whey or a vegetable starter culture to get thing going but in most cases it’s not necessary since the skins of fruits and veggies are full of lactobacillus. Salt not only adds flavor but creates an environment that favors the good bugs over the bad ones. Submerged in a salty brine, the good bugs work their magic and culture the food. The only product on the market at this time that is a truly anaerobic environment is the Pickl-It Jar. There are others out there but there are not 100% airtight. This matters if you are trying to fix major gut issues and/or want a very reliable result. KerryAnn of Cooking Traditional Foods has an excellent post on this subject Lactic Acid Bacteria and the Lowly Mason Jar. If that is not your goal, DIY air locks or the other products like the Perfect Pickler (I have not tested or even seen a Perfect Pickler yet) are not necessarily a bad option. The verdict is still out on the Tattler lids. My concern is whether the gases put of during the lactofermentation process releases the formaldehyde or not. It’s just not tested in this area. And of course you can still use regular mason jars and burp the jar to release gases. Just be aware that other bacteria can take hold in a non-anaerobic environment. I would highly recommend using whey or a starter culture if you don’t have a Pickl-It jar. Please note, I am not affiliated with Pickl-It and receive no commission on sales. So, this is why I choose lactofermentation over vinegar pickling. Have I convinced you to give it a try yet? I have lots of recipes to chose from! I am about to start a sauerkraut ferment in my pickl-it this weekend. I’m looking forward to seeing the results! I’m pretty new to the pickl-it though, and the last couple of tries with pickled veggies haven’t gone well. I think it was mostly the condition of the vegetables or perhaps my water? I used distilled water I believe. Haven’t done very much with ferments so far but hope to get it down and into the kitchen rotation soon. By not going well, what happens to your veggies? I’m glad you’re not giving up in spite. Nope I’m not giving up, I’m pretty stubborn I’m told ;-). My veggies turn out kinda slimy and smelly. The last thing I made was cucumbers and they turned out pretty much like the Pickl-it description of spoiled food :-(. I’m pretty convinced after thinking it thru today that it’s primarily the temperature in my home here in Texas. It is always over 72 in our house, even for most of the winter :-). The pickl-it faq points that out as a problem and I think I remember it as a warning in Wild Fermentation too. I’ve heard of some using a little wine refrigerator if their house is too hot … maybe that would help. Have you heard of anyone doing that? Aah, that makes sense. I have the opposite problem here in North Dakota. It’s hard to keep my ferments warm enough. Over the winter my kitchen is a balmy 55F. I keep a crock pot running under my ferment cabinet. I like the idea of lactofermentation, but I’ve never tried it because it seems quite complicated and very time-consuming. Really great post! I’ve always been ho hum about pickled veggies, but I love lacto-fermented veggies. I’ve shared this on my facebook page: https://www.facebook.com/pages/Learning-and-Yearning/229256057187940. Thanks for this. I have my own moso bamboo forest in NSW, and it’s spring here: shoot time! I’ve been pickling shoots in the past with vinegar, but this year I’ve tried natural ferment. Results are extraordinary. I’ll try the more methodical approaches mentioned here, but so far it’s just been fine raw slices (well leached over days), put in a jar with flavourings (mustard etc), pressed hard, covered completely at the top with Aussie olive oil, and left in the sun for a week or so. Why did I not do this sooner? I tried to sign up for your free newsletter, but it keeps telling me that I have an invalid email address. Could you automatically sign me up for your emails please? Thank you. I have just started fermenting and I am using jars similar to the pickle-it Mason Jars. Ones I have and used successfully are from France. The jar is heavy and the glass is thick too. I inspect my jars daily but don’t open them. What I notice is bubbles from bottom to top, when the cabbage is done the bubbles have stopped and my fermented veggies have been crisp and scrumptious. Thanks for a Great Discussion! (In exchange, here’s a sauerkraut tutorial by Sandor Ellix Katz!) | Eat Local, Read Local! I found this post in a search after I had a revelation that most recipes I have that call for vinegar can be converted to ferments…and here you are! I can’t wait to try some of your ferment recipes! Thanks!! I’ve had great success fermenting cucumbers, cauliflower, cabbage and asparagus. All without the use of expensive fermentation jars or air locks. And I let most veggies ferment for a few weeks to get them super tangy. None have ever gone bad or become moldy. The trick is to keep everything fully submerged under the brine throughout the whole process. 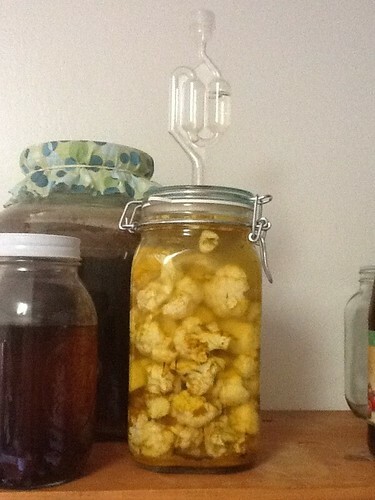 I use half gallon jars filled one third of the way with whatever I’m fermenting. Then I fill the jars with the salt brine so it covers the veggies by at least an inch. Then I take a zip lock bag and stuff it into the opening of the jar and fill it with enough water to hold down the veggies. I place the jar in a bowl or plate to catch any spillage during fermentation. Stick it in a dark cupboard for a week to 2weeks and voilà! Perfectly tangy ferments. When they’re done I remove the baggie, cover the jar with a lid and pop it in the fridge. BTW- the brine will become cloudy with sediment at the bottom. This is supposed to happen. Thanks for sharing your thoughts about natural breast. hi, this is so exciting and then I searched for these jars in South Africa and nope, they’re not sold here. do you perhaps know of anyone who can import them here? I think this will be the solution to all my health related problems…. Thanks ever so much for your fantastic post on fermentation using salt vs vinegar. Absolutely useful information. I was about using vinegar since I thought that would enhance the taste. But thanks to your clear , I’m totally convinced: From now on, long live lactofermentation!